Golden aspens glowing in the dusk light, overlooking Ruby Anthracite Creek, Marcellina Mountain, and the Raggeds Wilderness, Colorado. 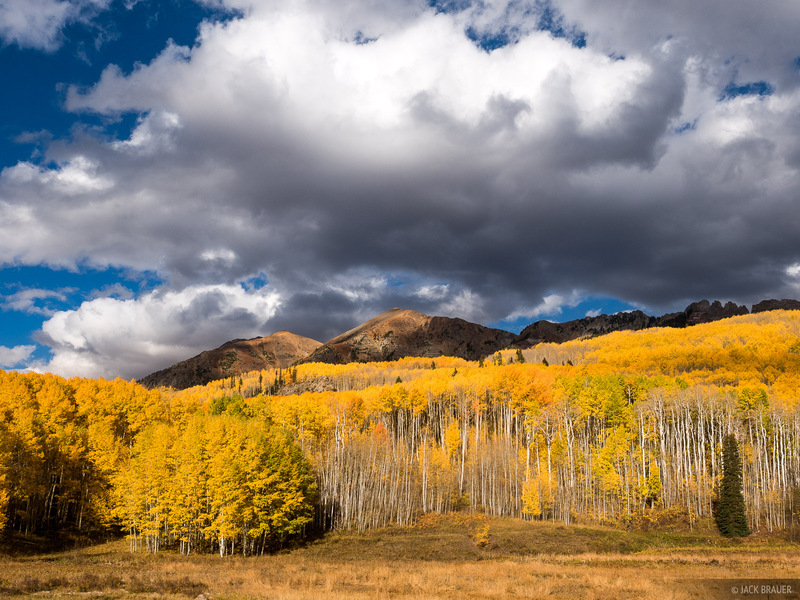 Kebler Pass is easily my favorite place to enjoy the aspens in Colorado, with the largest continuous mature aspen fields in the state and perhaps the world. This October was one of the stranger autumns transitions I’ve seen in Colorado; the aspens up on Kebler went from mostly green to peak gold in just a couple days, and a few days after that the color faded away. Myself and some photographer friends who were visiting Crested Butte were lucky to do a sunset hike up near Kebler Pass on the perfect day of peak color. 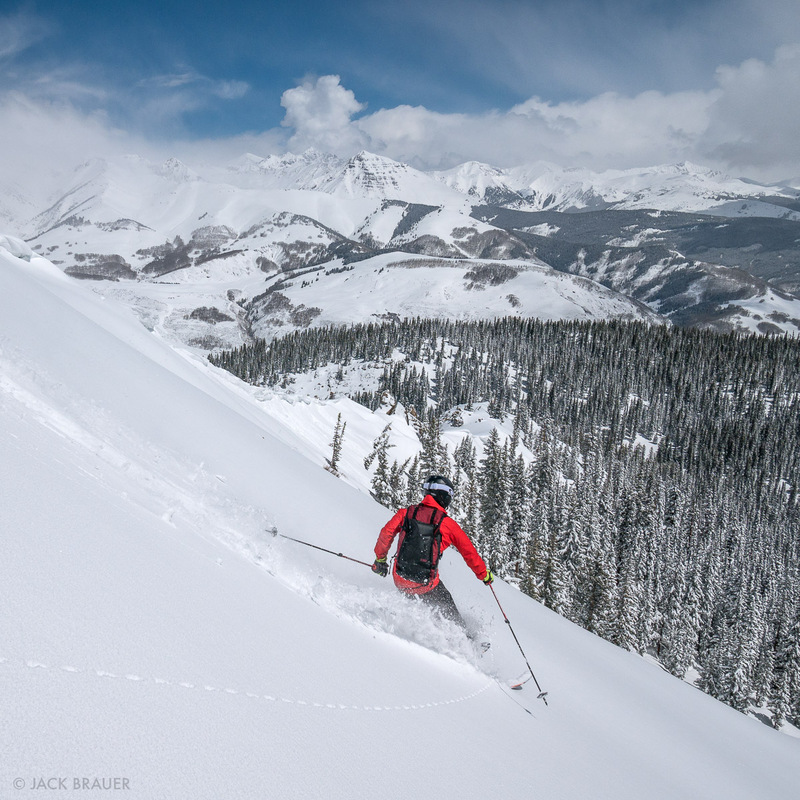 Posted in Colorado and tagged Colorado, Crested Butte on October 5, 2017 January 4, 2018 by Jack Brauer. Paul DiG. 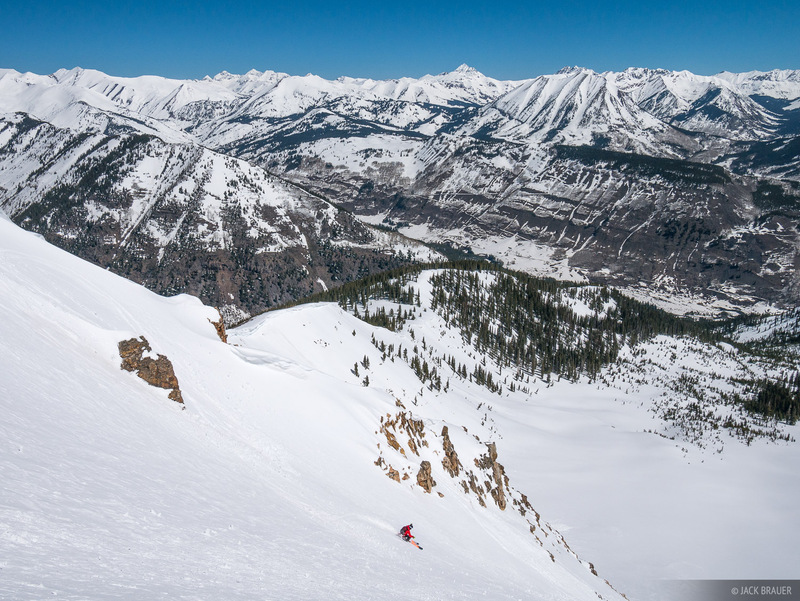 skis down the steep northeast face of Mount Emmons into Wolverine Basin towards the Slate River valley near Crested Butte, Colorado – May. Posted in Colorado, Skiing/Snowboarding and tagged Colorado, Crested Butte on May 5, 2017 May 5, 2017 by Jack Brauer. Paul DiG. skis Teocalli Bowl on Crested Butte, Colorado – April. Teocalli and Castle Peak are in the background. It’s off season in Crested Butte; the ski lifts are closed and the town is quiet. So when a spring storm dropped over a foot of fresh powder last week, we had the ski area pretty much all to ourselves! We spent the last four days hiking and skiing/snowboarding all the best lines on the Butte, except now there was no tracks, no moguls, no people, and no hurry – just perfect untouched pool-table-smooth powder. Here’s a few snapshots from our fun. Posted in Colorado, Skiing/Snowboarding and tagged Colorado, Crested Butte on May 1, 2017 May 5, 2017 by Jack Brauer. Paul DiG. 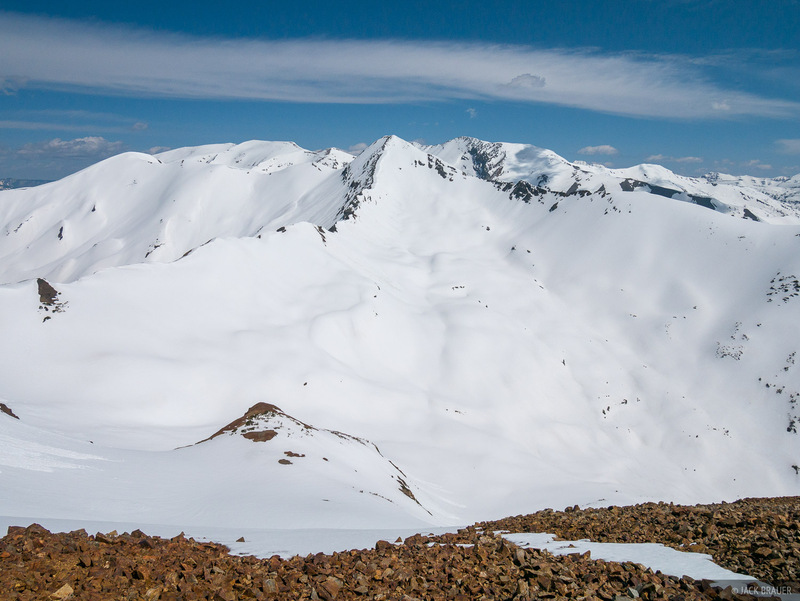 skis down towards the Slate River near Crested Butte, Colorado – April. So stoked to finally get out on the splitboard again after being sidelined all winter with a sprained wrist! Posted in Colorado, Skiing/Snowboarding and tagged Colorado, Crested Butte on April 23, 2017 May 5, 2017 by Jack Brauer. Mt. 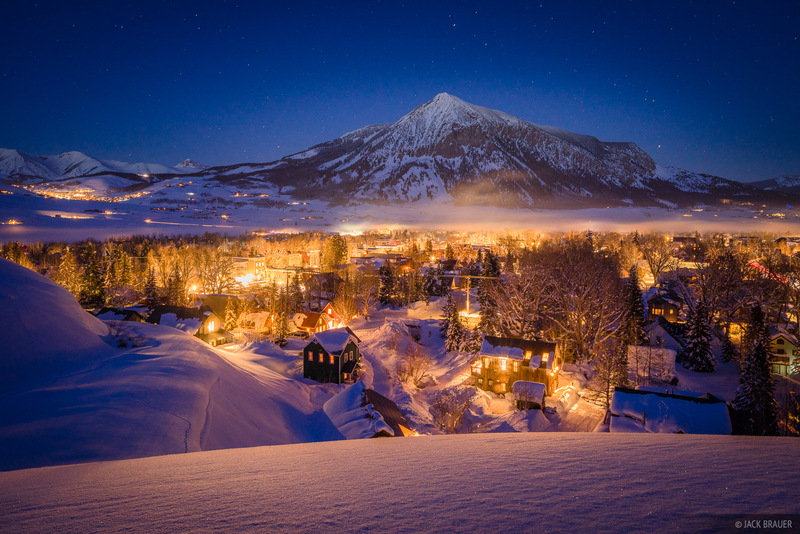 Crested Butte rises above the town of Crested Butte in Colorado after two weeks of January storms dumped 9 feet of snow. Posted in Colorado and tagged Colorado, Crested Butte on January 18, 2017 by Jack Brauer. 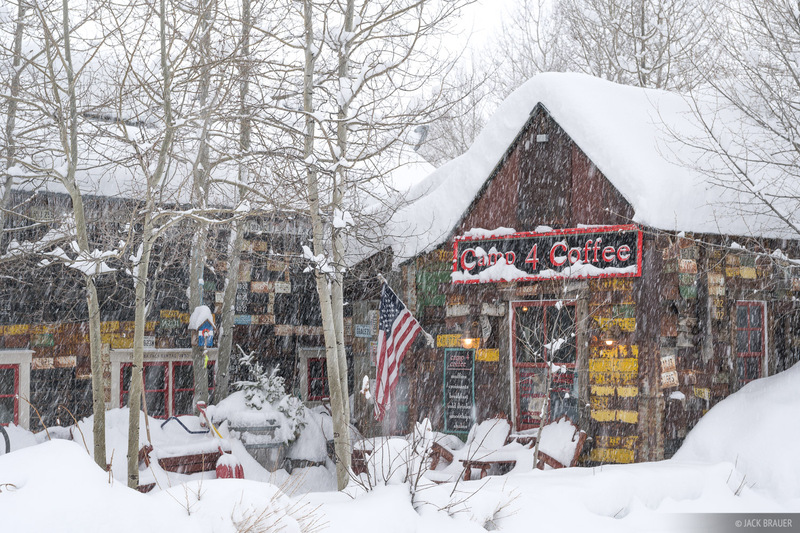 Camp 4 Coffee in Crested Butte, Colorado, smothered in snow during a week-long January storm. Last week’s snow storms dropped almost four feet of powder on Crested Butte! The official tally at the ski area for the week was 47″, making the Butte the big winner for snowfall amongst all Colorado ski hills for the week. CB oftentimes gets less snow than other areas due to a “donut” effect where the surrounding ranges block some of the storms. But when the storms come in at the perfect west/southwest angle the snow can funnel right into the valley and dump here! Fortunately for us, this happened during the first big storm a few weeks ago, during this last storm, and it looks like it might happen again with another big storm headed this way in a few days. This winter got off to a slow start but has been piling on in December and January! Suffice it to say, I’ve been out there shredding up as much of this pow as I can, with some great mornings at the Butte and an epic day at Monarch Pass. It would be fine with me if it keeps snowing until June! UPDATE 1/15: The snow total for CB in the first two weeks of January has grown to 9 FEET! This is a January to remember! Posted in Colorado and tagged Colorado, Crested Butte on January 7, 2017 January 15, 2017 by Jack Brauer. 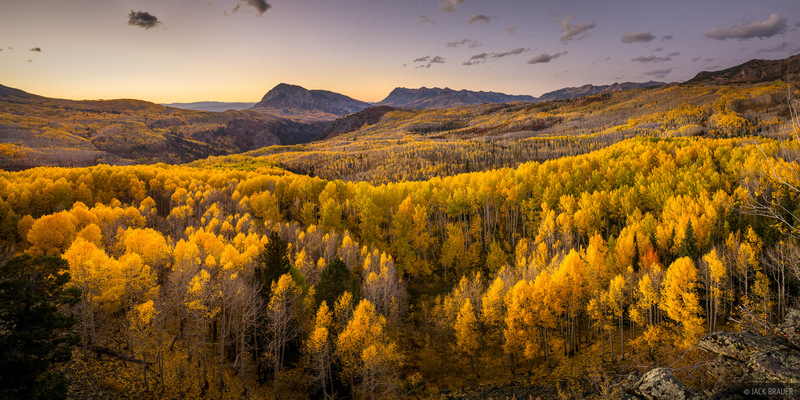 Golden aspens illuminated by sunset light, with Marcellina Mountain in the distance. Near Kebler Pass in the Elk Mountains, Colorado. We are finally back home in Crested Butte, Colorado after our big 3.5-month road trip! 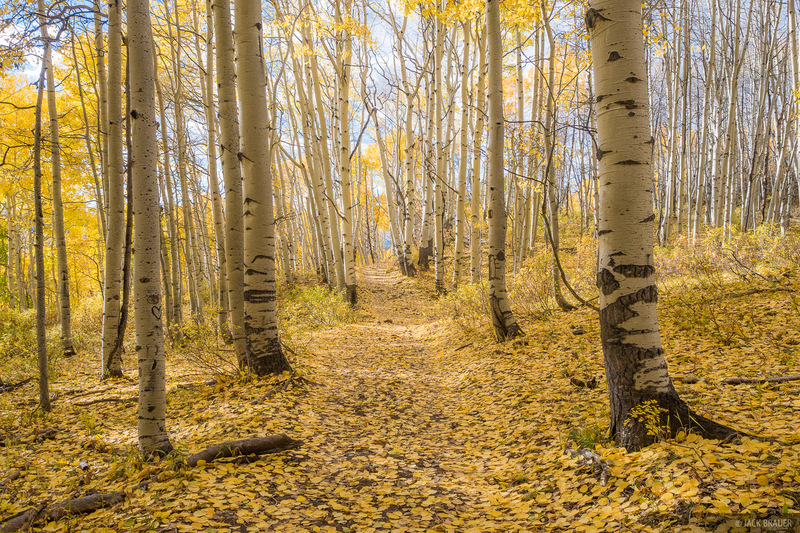 On our first day back here yesterday I celebrated our return with a hike through the aspens up near Kebler Pass. I’ve been looking forward to this moment for several weeks now and it was nothing short of awesome, with the aspens at peak goldenness. 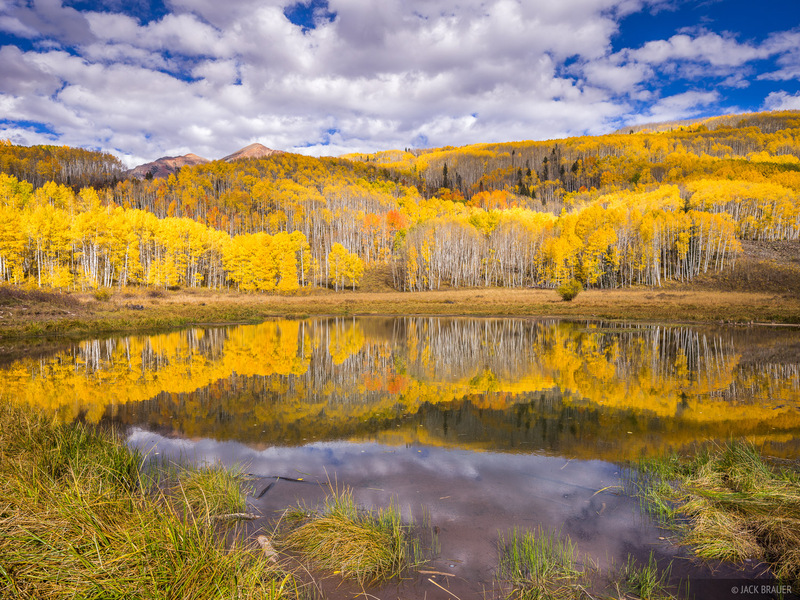 Golden aspens reflected in a beaver pond near Kebler Pass. The vast fields of aspens up near Kebler are like the redwoods of aspens forests — I know of no other place with such an abundance of pure, large, white aspen boles. 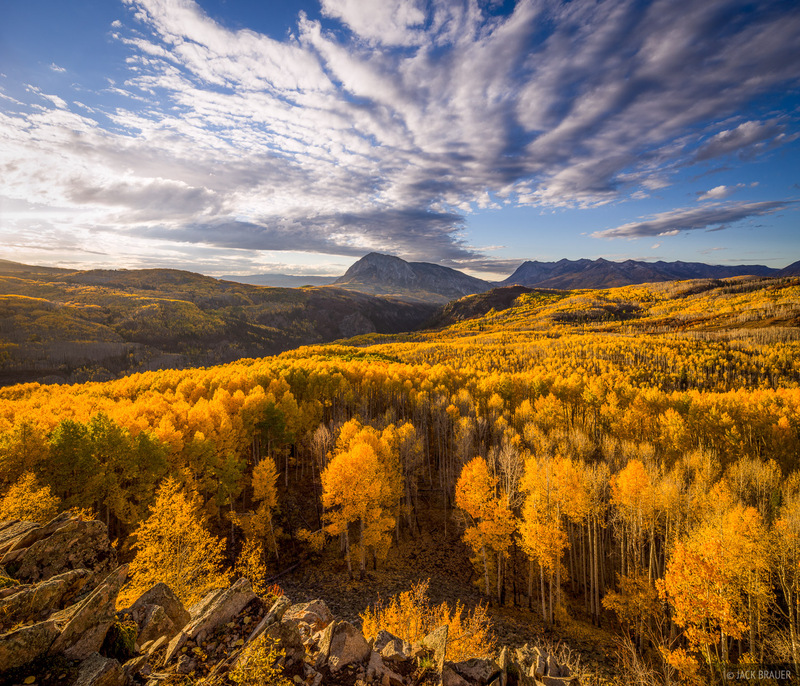 Golden aspens near Kebler Pass. Walking amongst the golden aspens, I’m filled with an almost tangible feeling of the glory of our Earth, like walking through a cathedral of light. Honestly, I think this is the most beautiful thing to be experienced in nature — more beautiful than wildflowers, than waterfalls, than auroras even. A trail through the aspens. I’m so happy to be home, so stoked on Colorado! 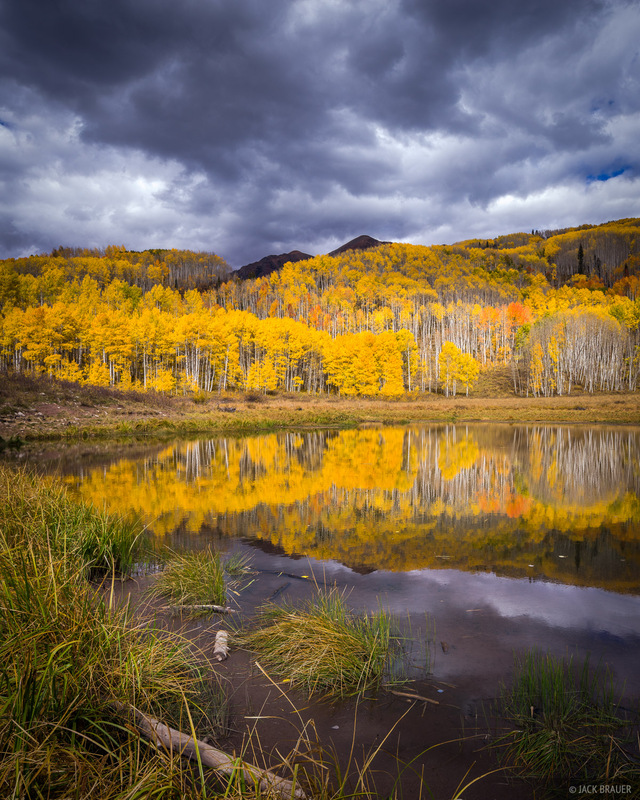 Posted in Colorado and tagged Colorado, Crested Butte, Elk Mountains on October 3, 2016 October 4, 2016 by Jack Brauer. 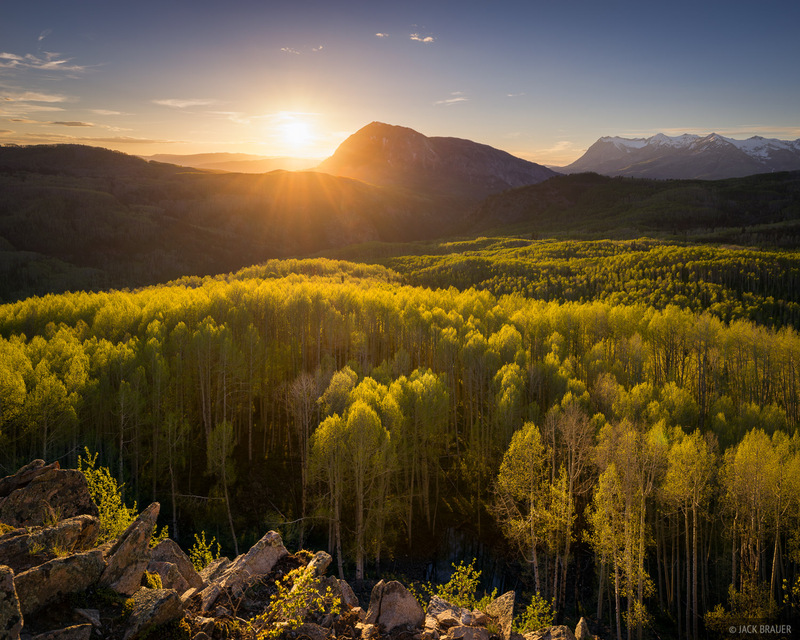 Sunset behind Marcellina Mountain, in the vast fields of aspens near Kebler Pass, Colorado – June. Posted in Colorado and tagged Colorado, Crested Butte, Ruby Range on June 4, 2016 June 4, 2016 by Jack Brauer. 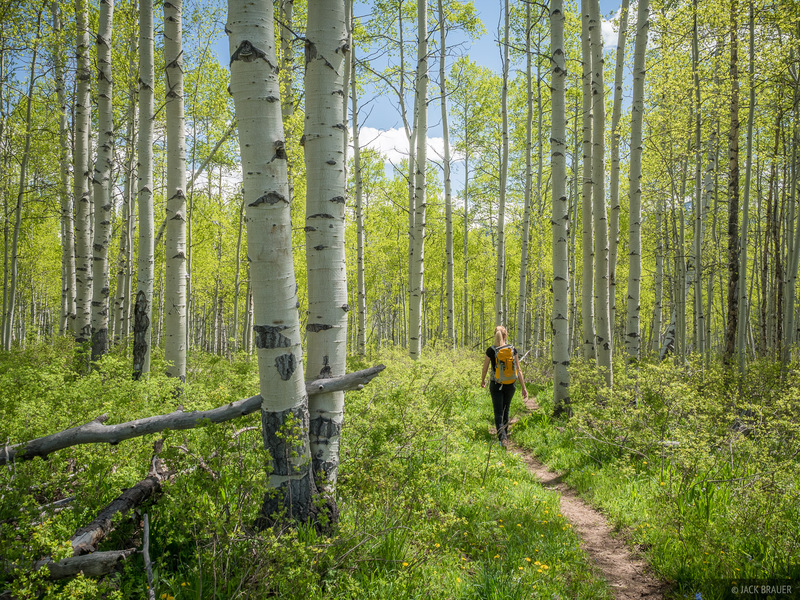 Hiking through bright green freshly budded aspens near Kebler Pass, Colorado – June. Posted in Colorado and tagged Colorado, Crested Butte, West Elks on June 1, 2016 June 3, 2016 by Jack Brauer. 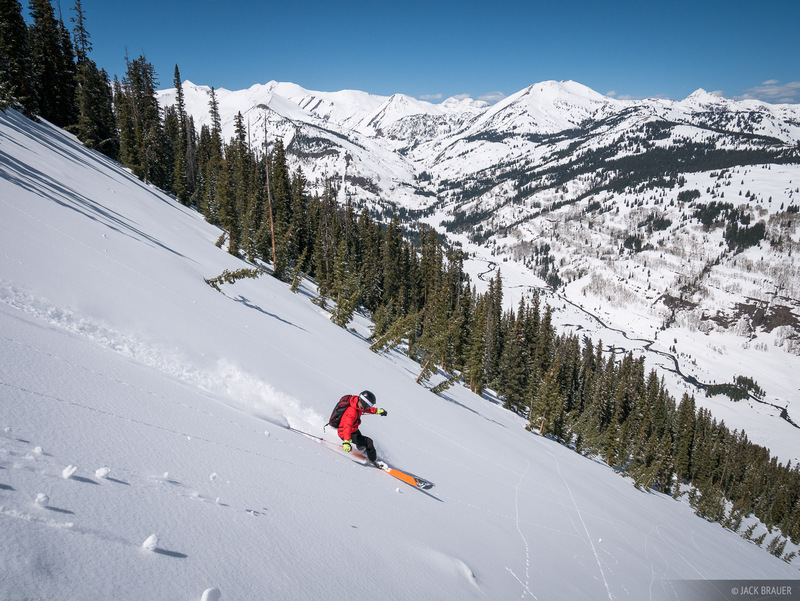 The ski area of Crested Butte oftentimes suffers from lower-than-expected snowfall amounts, but just 9 miles to the west/northwest the Ruby Range gets hammered with some of the highest snowfall totals in Colorado. All winter long I’ve gazed wistfully at the snow-smothered Ruby Range peaks, tantalizingly out of reach for those of us without snowmobiles. In late May now that much of the lower access roads have melted out, yesterday I finally had the chance to get out for a spring descent up in these mountains. Daniel and I hiked up and skied/rode down Mineral Point, the prominent pyramid-shaped peak visible up valley as you drive into the town of Crested Butte. The south face of Purple Mountain (12,958 ft.) in late May, begging to be skied. 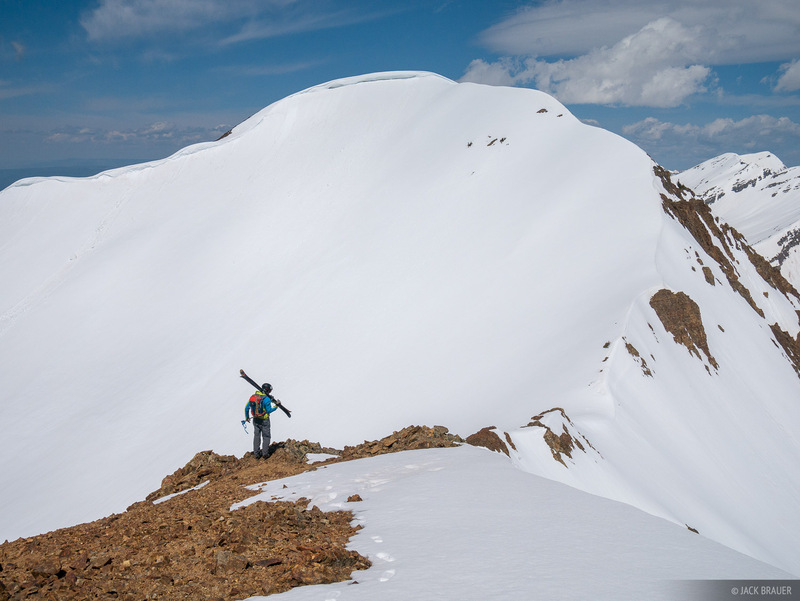 Posted in Colorado, Skiing/Snowboarding and tagged Colorado, Crested Butte, Ruby Range on May 26, 2016 June 3, 2016 by Jack Brauer.